OK, maybe not all of us. But a lot of us. Really a lot. Cornell political scientist Suzanne Mettler has an article in the Washington Monthly about what she calls the “submerged state,” or the massive amounts of money at play in various tax deductions (eg. the mortgage interest deduction) that benefit particular populations. As the chart below shows, there are all kinds of tax deductions that many people take, but those same people continue to insist that they don’t get any help from the government. 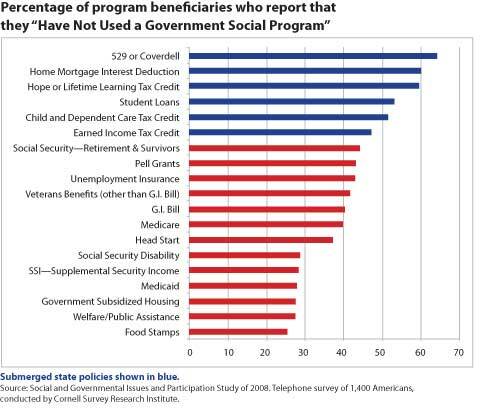 Mettler’s point, backed up by her survey data: despite their cost, these programs are invisible to the public, making the public more susceptible to claims that government is too big. Jack Balkin has a great post describing how Congress, particularly the Republicans, are acting like a European style parliament. His forecast: more gridlock, worse policy, and a decaying country. Harvard Magazine recently ran some excerpts from the final chapter, where the Frieds move off of torture per se and more into the general obligations of a president to the people. They discuss that at times a president might break the law because he thinks the law will not allow him to do what is necessary to save the country, as did Jefferson in 1807 and Lincoln in 1861.The Frieds liken this law breaking to civil disobedience, with “a fundamental allegiance to the political community and its system of laws and government.” Executive law breaking while maintaining ultimate fidelity to the state and its system is civil disobedience; law breaking outside this fidelity is a coup. Bad timing for David Rivkin, who used Tuesday’s Wall Street Journal for one of his monthly attacks on some Obama policy. This time it was about the Christmas Day bomber, with Rivkin saying that not immediately sending the bomber into military detention was “an intelligence failure of massive proportions.” Too bad that the very next day, today, the exact same newspaper reported that the Christmas bomber is again talking to the FBI, providing “valuable intelligence.” This also damages the arguments of this guy and this woman. Look, there are valid reasons to say that terrorists should be viewed as wartime combatants rather than criminals. But claiming that we won’t get good information from terrorists held in the civilian legal system is clearly not a valid reason. And there is at least one good reason not to throw them in military brigs: it creates an appearance of the US being at war with Islam, which appearance seems to generate more terrorists. Finally, I would like to note, again, that George W. Bush also tried terrorists in civilian courts. For Republicans to now claim that this approach is terribly weak is to be hypocrites of the worst sort. Which is, I supposed, to be expected from politicians. I was reading recently about Senator Byron Dorgan’s retirement, and the article claimed that he had been in politics for 40 years. I looked up his biography on his official site and on Wikipedia, and both confirmed the 40 year figure. Dorgan worked in business for 2-3 years, and then became State Tax Commissioner at age 26, and has been an elected official ever since. Then this weekend’s NY Times magazine had a long piece on the GOP’s moderate vs. Tea Party battle, as personified by the race in Florida between Charlie Crist and Marco Rubio. It turns out that Rubio has never done anything but hold elective office, serving as a West Miami city commissioner right out of law school. Dorgan and Rubio might be great legislators — I don’t know enough about either of them to judge — but doesn’t it seem like we should want our politicians to have lived in the real world? Think of all the things we regular folks have to do: hunt for jobs, worry about insurance, cooperate with coworkers we hate, shop for cars, get things done at work, etc. Career politicians don’t have to do any of that stuff. They never need to execute and accomplish, and they get rewarded for being obstinate. They stop worrying about money, since they get to pay their family as “consultants” out of campaign funds. And they have staff to take care of life’s little details. I’m not expecting our politicians to follow the lead of Cincinnatus, who left his farm to run Rome, and then returned to his farm. But maybe some experience in the real world, not the political world, would get our legislators to work — WORK — on policy, instead of spending all their time posturing and campaigning.